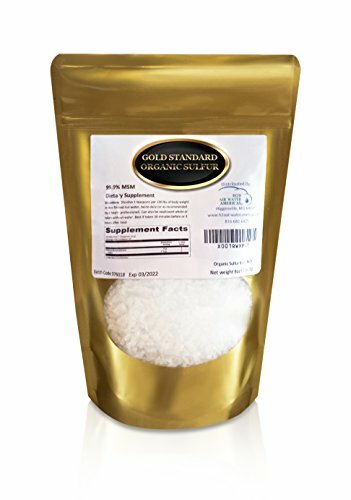 How Safe is Organic Sulfur? Organic Sulfur is extremely safe. Look at it this way, we know as a society that we need iron, magnesium and potassium. These are all elements on the periodic table. Well, we need sulfur, too. ✔ THE HIGHEST QUALITY AND PURITY ON THE MARKET: #1 Recommended Organosulfur Supplement by Independent Researchers. 99.9% Pure, Therapeutic-Grade Methylsulfonylmethane. ✔ BEST VALUE: Provides far more absorption power and effect than cheaper, knock-off crystals and 500-2000% more MSM than most pills, powder, or capsules. ✔ WE ARE THE GOLD STANDARD: Don’t be fooled by copycats. We are the original gold bag, the original and BEST Organic Sulfur Crystals – 99.9% Pure MSM. Benefits: Healthy Joints, Allergies, Skin, Hair Growth, Nail Health. ✔ EXPERIENCE THE GOLD STANDARD DIFFERENCE: The Gold Standard difference is the large size of our crystals and the unmatched absorption and potency. No one matches us in quality, size, purity, and absorption, no matter how hard they try to copy us. ✔ THE VERY BEST MANUFACTURING: We start with Quality American DMSO, not dirty petro chemicals like cheaper brands. Double Distilled for Maximum Purity. We use low heat because overheating diminishes effectiveness. With our crystals, you get no fillers. No anti-caking additives. No binders. Our crystals are manufactured just for us in a facility with high oversight, hands-on, quality control.